Difference Between a Cantilever Gate and a Sliding Gate | Pacific Fence & Wire Co.
Just as a square is a special kind of rectangle, a cantilever gate is a unique type of sliding gate, but with distinctive, interesting differences from your typical gate with wheels. location of the wheels that helps the gate move. A cantilever sliding gate rests and rolls on a wheel on the front bottom edge of the gate with a track supporting wheels on the back edge. In contrast, a cantilever gate is held above the ground, moving along rollers running along the top and inside of the fence, with wheels attached to a vertical concrete foundation. Generally, the space required to accommodate a sliding gate is the same as the width it covers, with a few extra feet for access. 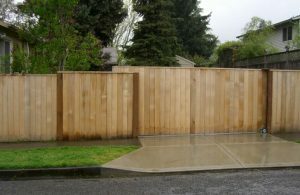 A 30-foot wide driveway would need to have 30 feet on one side for gate storage and about three feet to allow maneuverability around the gate frame. A cantilever gate needs to be about 50 percent wider than its span to counterbalance the weight of the suspension posts. Because sliding gate frames aren’t supporting mounting posts, they don’t require the material strength and rigidity needed for cantilever gates. The frames for sliding gates are smaller overall, making them less expensive than cantilever gates. Sliding gates have simpler and smaller operating mechanisms than cantilever gates, and as a result, roll more easily. But wheel contact with the ground can make operation noisier than cantilever gates. Since cantilever gate wheels are off the ground, this style can span a wider range of terrain including gravel, grass, blocks and uneven, angled or steeply inclined surfaces. The absence of contact with the ground also allows cantilever gates to function easily in snowy or icy conditions. The smaller frames of sliding gates make materials easier to lift, while the weight of cantilever gates requires a crane. Sliding gates, however, may require concrete footings or ground track installation in the existing driveway. Cantilever side posts are installed with no disruption to the drive, making this part of installation easier and faster. Sliding gates can be shifted from the track, making them more susceptible to breaches. Cantilever gates can’t be lifted and as a result, may be more useful when security is a concern. If you’re looking at a gate for residential, small commercial or industrial interiors and face some space limitations, then a sliding gate may be the right choice for you. For high traffic areas, with rougher, outdoor terrain where installing a ground track isn’t possible, or if you’re facing security considerations, a cantilever gate is the better alternative. Talk with our team at Pacific Fence & Wire about our high-quality sliding and cantilever gates. We’ll find the solution to fit your needs, with expert installation to ensure reliable performance.